I don't think this one has been seen before but a nice clip of parts of London in 1924 with buses in view. It's the earliest known colour film footage. There is plenty to interest people with any passing interest in history. And here is a follow on clip of mixed footage from the 1940s. Again nice bus footage but the impact of war is incredible to see. Another clip - this time of Piccadilly Circus in 1945. Only a few buses pass by but the number of people milling around is interesting. Note also the numbers in military uniform and the US Army lorry that drives past. Quite thought provoking given it was not long after WW2 ended - it all looks relatively normal despite 6 years of hell. 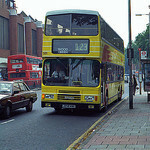 Another film clip - this time largely of red London double deckers. Although Mr Humphreys says it's in tribute to the Routemaster the RT family actually predominate in the clip.